Because we believe that, with the proper gear, very few things are more fun. And so it follows that we also believe that if you are new to the sport — or are returning to skiing after a long time away — then you ought to get on skis that will allow you to be as comfortable and have as much fun as possible, right away. Every single time we are on the mountain, we see new or inexperienced skiers on skis that are not doing them any favors. At all. The skis they’re on are actually making the activity of skiing harder and / or scarier than it needs to be. So we’ve created a list of some of the skis that we think work really well for beginners, and here we’ll explain why we chose the skis we did, and discuss the characteristics of a ski that will serve well those who haven’t (yet!) spent a lot of days on the mountain. Our answer is not what we often see on the feet of less experienced skiers: very narrow rental skis. In fact, we also believe that this is a huge problem for the entire ski industry, yet nobody seems to be doing anything about it. Which is incredibly stupid and shortsighted. And so we are going to be saying more about rental skis soon. Stay tuned. Instead, there are some skis that will work particularly well for inexperienced skiers, and some that don’t — and this has to do with the shape, width, flex patterns, and weights of the ski. 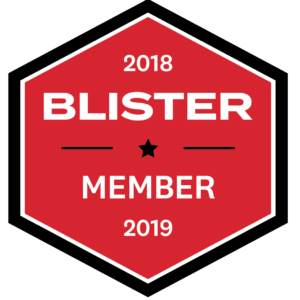 In other words, we will argue that many of the skis that will work best for beginners are actually skis that can also work really well for certain advanced and expert skiers, too. We’ll say more about this as we go. This line of thinking, while understandable, has probably ended up driving more people away from the sport of skiing than anything else. It is true that a newer skier will not know what type of ski he or she prefers, because you can’t know that until you’ve skied a number of different skis. But just because you don’t know yet — and couldn’t possibly yet know, since you are new at this — what type of ski you personally like or dislike, it absolutely does not follow that any old ski will work for you. #1: Get a ski that has a considerable amount of tip rocker. We highly recommend reading our article, Rocker 101: A Brief History of Rocker + A Glossary of Terms, for more info on rocker and camber profiles. But here we’ll give a brief primer to provide a bit of background info. Before around 2002, pretty much all skis were what’s called “traditionally cambered.” This means that almost the entire length of the ski was bent upwards (see the the black section of the ski pictured below). Profile of a ski with full, traditional camber (cambered section shown in black). 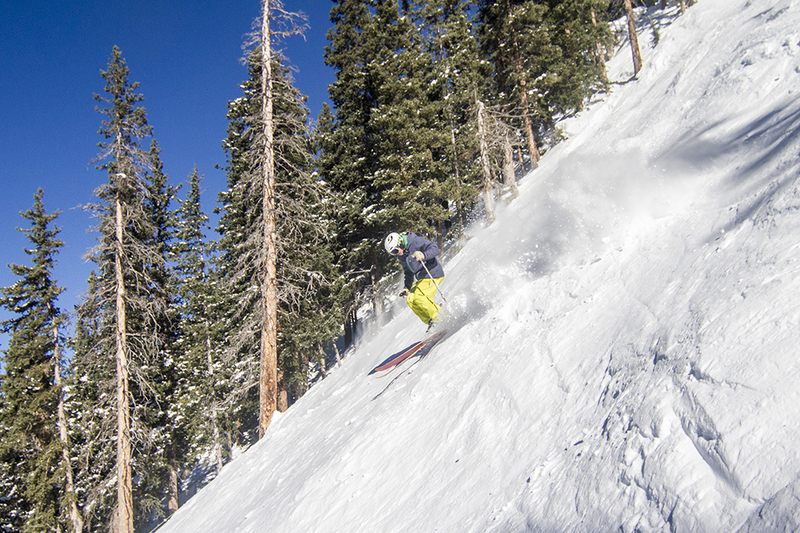 Camber is great for making a carved turn — i.e., tipping the ski sideways and digging one side into the snow. But if you’re learning to make turns for the first time, you probably won’t be going fast enough to do so, and you’re almost certainly not trying to make aggressive, cleanly carved turns. Instead, you’re probably focused on staying in control and not going too fast, while doing your best to maintain your balance as you slide down the mountain. These are big accomplishments for any newer skier, and the initial, foundational steps that every skier must take. But skis with full traditional camber can make these kinds of turns difficult, since traditional camber is designed to help you grip the snow and dig in the edges of your ski, rather than slide your ski across the snow. For sliding turns (rather than carving them), “rocker” can be very helpful. Rocker essentially means that the tips and / or tails of the ski are raised off the ground / snow earlier than a ski with full traditional camber (see the image below). Think of a boat hull — the front is curved upward to help the boat plane up and through water. It’s a similar concept with ski rocker — a ski with rockered tips can plane up and over softer snow, and allows the ski to feel “looser” and easier to slide around. Profile of a ski with some tip and tail rocker (rockered sections shown in green). While skis with rocker were initially designed to help the skis rise up in deep snow, rocker also makes it easier to initiate turns and get the tips of your skis pointed across the slope. And not only does tip rocker make it easier to get your skis to turn left and right, it makes it easier to make turns at slower speeds. And good maneuverability at slower speeds is a very nice attribute when you’re getting used to turning your skis. So if it’s your first time on the mountain, even if you’re working specifically on making wedged turns (aka, “pizza” or “snow plow”), fully cambered skis aren not making things easier or more enjoyable for you. #2: Get a ski that has a bit of tail rocker, too. A ski with rockered tips will be easier to swing across the hill, and rockered tails will make this easier still. Skis with flat tails finish turns with a more powerful, consistent feel. That’s a good and really fun thing if you are able to pressure them through a solid turn with an athletic, forward stance (which is a more advanced technique). But when you’re first getting on snow, that feeling of really driving a ski and using its edges to arc a turn across the fall line isn’t something you will be comfortable with yet. 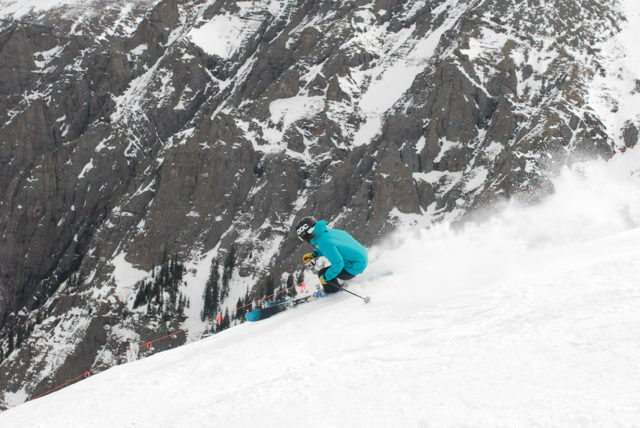 In fact, it can be a bit scary when a ski’s edges dig in as you pick up speed through a turn; you’ll feel like you aren’t in control, and you very well may not be in control. So as you are working on staying balanced over the front of your skis and engaging your edges, you will inevitably find yourself with your weight on your heels. And when you do get back on your heels, a ski with a flat, non-rockered tail is more likely to catch on the snow as you accelerate down the slope. Skis with some tail rocker won’t be as “grabby” in this way. Their tails will release out of a turn more easily, allowing you to make controlled turns more easily and recover if you get knocked off balance and onto the back of your skis (we call this getting pushed “backseat”). But our advice to new or less experienced skiers is to rent or buy skis that have a decent amount of tail rocker. Steer clear of skis that have flat tails. #3: Get a ski that is ~85mm to ~105mm wide underfoot. The firmer and smoother the snow is, the more appropriate a relatively narrow ski is to learn on, or to ski on at any ability level. Narrower skis (~70 mm to ~ 85 mm underfoot), are easier to tip on edge and can be flicked from your uphill edge to downhill edge more quickly, which can be useful when you’re learning to link turns together. However, slightly wider skis, (think ~95 mm underfoot), aren’t much more difficult to get on edge, and they make things easier when you’re skiing on soft, slightly bumpy snow. You’ll often encounter this sort of snow — even on groomed trails — by the middle or end of a day, since all the skiers will have pushed around snow into inconsistent piles while making their turns. Wider skis will plane over and cruise through loose piles of snow on the trail better than narrower ones, and wider skis won’t get knocked off track as easily. This is important because you need to be able to trust your skis as you’re learning your turns, not feel like you’re getting bounced around as you’re fighting to control them. Skis much more than ~105 mm underfoot are often even more stable in less consistent snow and float better in deep snow, but as a beginning skier, the stability you gain from a ski that wide is less important. You won’t be going fast enough to really take advantage of the extra width, and they will be a bit more difficult to tip on edge when conditions are firm. Jonathan Ellsworth on the J Skis Metal, a wider, versatile ski. That said, if you ski at an area that gets a lot of fresh snow, or where the snow is typically very soft (e.g., the Pacific Northwest of the United States), having a ski in the ~100-105 mm range could be a viable everyday option. #4: Get the appropriate length. All too often, newer skiers end up on a ski that is too short. For a full breakdown on how to choose the right length for you, check out our Gear 101 piece on How to Think about Ski Length. But a quick and easy generalization is that you should choose a ski that’s about the same height as you are, or just a bit shorter. Because if you have followed our advice above and you are looking at a ski with tip and tail rocker, the length of the ski that will be touching the snow while you turn will actually be shorter than the entire length of the ski (since the rockered sections are raised off the snow). As a result, a ski with tip and / or tail rocker will feel significantly shorter on snow than it looks standing next to you in a shop. So while going with a (tip and tail rockered) ski that’s about as tall as you are might seem intimidating, trust us on this one and do it anyway. #5: Avoid skis that are extremely light, and avoid skis that are extremely heavy. In other words, when it comes to weight, avoid the far ends of the weight spectrum. These days, it is more likely that someone will try to send you out on a ski that is “super light and awesome.” Or you might pick up a ski and love how extremely light it feels in your hand. But don’t be fooled. In terms of weight, stick with a ski that is neither super light nor super heavy. Generally speaking, a lighter ski will be easier for a beginner to control, especially when it comes to initiating turns on groomed snow. However, skis that are extremely light will get knocked around and deflect more rough, bumpy, or chunky snow than heavier skis, which can make skiing on unsmooth snow more difficult. 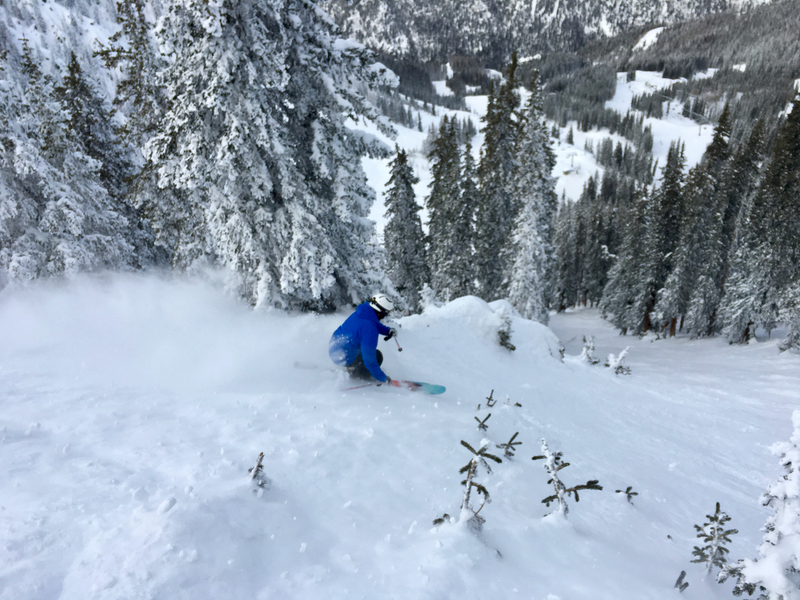 As you gain experience and are more comfortable skiing at higher speeds through tricky conditions, you may come to prefer a heavier, more “damp” ski. Heavier skis typically don’t get knocked as much while skiing fast through rough snow, making it easier to stay balanced while skiing fast. Then again, some expert skiers dislike heavy skis, and prefer a lighter, more playful ski, even in variable snow. So they are willing to forego the inherent stability of a heavier / more damp ski, and work a bit more themselves at staying balanced on the ski. #6: Look for a ski that has a medium or medium/soft flex. Honestly, you don’t really need to worry about this right now. As you spend more time on snow, you will come to learn whether you prefer stiffer skis or softer skis, and that simply comes down to personal preference. But for now, here are a few notes on that. A ski with a flex that’s too stiff can make things harder than they need to be when you’re learning to ski. In conjunction with the criteria above, a softer flex means that a ski will be more “forgiving.” Generally speaking, it will be easier to recover on if your weight gets shifted too far back, and will help smooth out the ride if you hit a patch of bumpy snow. But to be clear, many expert skiers still prefer to ski on rockered skis with softer flex patterns, too. They are generally more forgiving (which is good for beginners), but they also allow for a more playful skiing style and can be easier to work through a greater variety of turn shapes. In the vast majority of our full ski reviews on the site we list a “Flex Pattern” section, where we break down how stiff / soft the ski is from tip to tail. 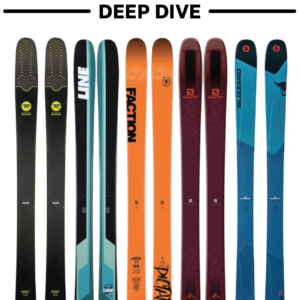 This should help give you a better idea of how stiff a ski is, and for many of the skis listed on the next page you can click the title to check out our full review and flex pattern notes. With this guide, our hope is that people new to skiing (or those who have skied a few times and are keen on going more often) will have a better sense of what sort of ski will initially work best for them. And as you progress, you’ll learn more about the sort of skiing you enjoy most, whether it’s making big, fast turns; finding natural features around the mountain to jump off; or making lots of turns at slower speeds down groomers, through moguls, or in tight trees. But the most important thing is for you to really enjoy your initial experience on the mountain, and to see for yourself why millions of us love the great sport of skiing more than we love most things. Once that’s happened, you’ll have plenty of time down the road to think about what type of ski might suit you as you spend more time on snow. 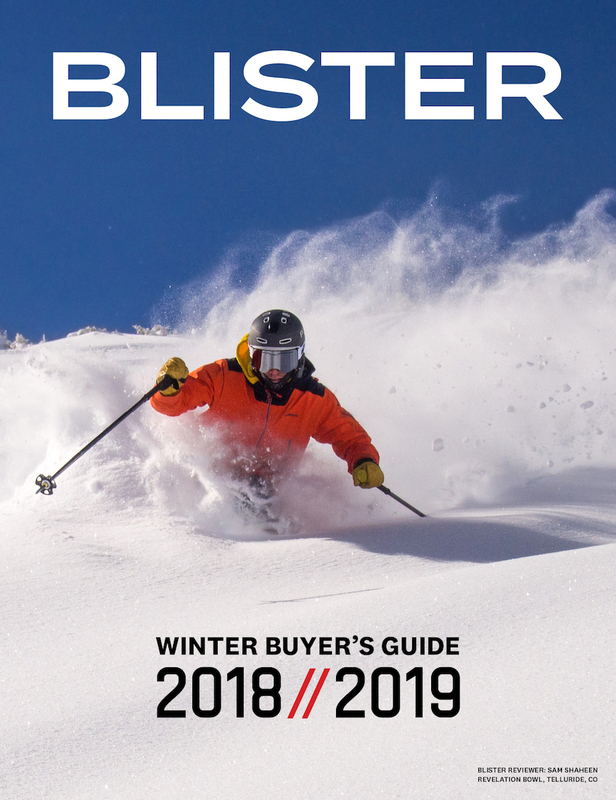 And if you are ready to check out over 400+ ski, boot, bindings, apparel, goggles, helmets and other products, you can also check out our 18/19 Winter Buyer’s Guide. Check out the current skis we recommend for beginners — or those returning to the sport. Love it! Very similar to the 101 from a few years back but enjoy the greater detail on ski width. Can’t wait for Part 2. I wound up with the right skis mostly by trial and error. This is a great summary of what to look for when buying skis. Only thing I wonder about is the length – but if we assume beginner skiing is going to be on groomers and if those skis have a lot of rocker then one might want skis as long as height, but those longer skis might be more problematic off piste, which is OK as long as the beginners stay out of the trees and stay on the groomers. But the only downside to shorter skis for a beginner is some chattering on the groomers, which is not much of a downside. I am on the fence regarding length. Thank you, Bill. Dialing in the exactly correct length is always going to be a bit tricky. Even when we’re reviewing skis around here, we often debate whether we ought to go with a longer or shorter length of a ski. But that said, we can instantly home in on 1 of 2 lengths — and that is exactly what we hope this guide allows everyone to do: narrow the decision down to 1 or 2 specific lengths. From there, I’d say the points you raise are fair, and I’d only add this: (1) rockered skis *should* be longer — and shorter (rockered) skis will “chatter” more, generally, given that they already have such short effective edge (e.g., the tips and tails of the ski will always be off the snow / never making contact with the snow). So it’s okay if the skier opts for the shorter of the “1 or 2 length” options, but he or she should not talk themselves into going shorter than that. And (2) re: tree skiing, I truly think that the only time length would become a detriment here is if beginners are skiing in trees that are so tight that no beginner has any business being in them. Which is to say, any “beginner” who is venturing into his or her first tree skiing will be on slopes where the trees are fairly well spaced. If they aren’t, then the skier is in terrain he or she shouldn’t be in. The last thing to say is that going with a longer tip and tail rockered ski also provides a longer – and more stable platform. I see all the time 6’0″+ 200 – 230+ lb skiers on 167 cm or 172 cm rental skis, and those skis are not providing enough fore and aft stability. So do keep in mind that going shorter won’t only result in more chatter, going too short can cause a loss in stability / reduce the sweet spot of the ski. And given that newer skiers are often trying to just get comfortable balancing on a ski, going too short won’t help the cause. Just some additional things to consider. Good article but why the pics of experts on expert terrain? Thank you for this piece! It sums up what every skier, beginner or advanced, should know about skis. In other reviews, you discuss binding mounting location. Is this a relavant consideration for beginners? Not sure I would want to teach small “never-evers” to wedge on an 85mm to 105mm ski. I know what you’re getting at but I think I still prefer a narrower shaped ski to work on proper technique from the ground up. I’m just afraid the width and rocker you suggest will perpetuate the poor technique we see in powder skiers, even in Warren Miller films. I certainly know what you’re getting at, too, David. And while this is certainly a very big topic, I’d argue that this way of looking at things is a significant part of the problem. I.e., the less experienced or new skiers I see on the mountain – all the time – on the narrow skis you’re referring to — are *not* in ski lessons, they are by themselves or with their friends … and they are seriously struggling, suffering painful and / or embarrassing falls, etc. So I think it’s a false start to assume that skis for never evers ought to always / only be the skinny skis that might make sense for lessons or good for teaching people how to use their edges. Instead, I think the first priority is to do everything possible to help people who are trying out this sport just enjoy their first time on the mountain, and to give them equipment that will make that more likely, right away. Do I think it would be good if the vast majority of never evers got into a lesson right off the bat? Maybe. Probably. But there are too many skiers ought there who don’t go this route to make a case for sticking with the old ski shapes. And I think it would be more effective to get people on equipment that will work for them right away — then get them excited to take some lessons — than to set them up on equipment that will cause them to struggle … then somehow expect them to want to go sign up for lessons so that they suffer less and fall less. That seems like an almost twisted way of initiating people into the sport, no? Now you’re making me think deeper about this. I was, admittedly, coming from my personal ability perspective as a former racer and a decent skier. For me, a 65mm FIS slalom ski is the absolute best on hard pack or any groomer that is not too soft. (I have a quiver of 4 different skis, Blizzard FIS slalom 165cm, Volkl RTM 84 177cm, Nordica Enforcer 100 185cm and Liberty Joe Schuster Pro 184cm. Plus some Armada JJ’s I just picked up at a ski swap for $50! Also, the Enforcers are new. Have not skied on them yet. I got them because I felt the gap between the RTM 84 and the Liberty was too big and needed a filler!) If the groomer starts to soften up a bit I love the RTM 84’s. As groomers are more common than powder days I love to get the most out of them. For me, arcing groomers is close to the joy of powder but as great powders days are the rarest of days they trump all other conditions. If there is soft snow I jump on the wider skis, and as you stated in a different article, they do make skiing easier. You can ski much more aggressively, or not, whatever you prefer. The Liberty Joe Schuster pro at 122mm underfoot with its rocker and softer flex, though not a real soft ski, is amazingly playful and easy to ski in powder or anything soft enough to engage some of the tip. On hard pack, it feels like there is nothing in front of you. I do, however, like to use the front of my skis quite aggressively. As I stated I have been looking at this more from the perspective of, 65mm shaped skis are best for me on groomers so they must be best for everyone else too. I’m willing to rethink this and maybe think a little wider. Too wide on hard snow and the pressures get tricky. They do need a little more snow under the base on a wider ski to be comfortable. I was also coming from the assumption these skiers were staying on the groomers with their skill set. I am assuming you are talking about skiers out with friends, not in lessons, skiing all parts of the mountain. All mountain skis should definitely be wider and to think of an all mountain ski, like we used to, without some tip and tail rocker is laughable. The slight tip and tail rocker on the RTM 84 makes it much friendlier and bends nicely into an arc along with the rest of the ski when asked. I am a ski school director/ ski instructor at a small, new, startup in northern Utah. 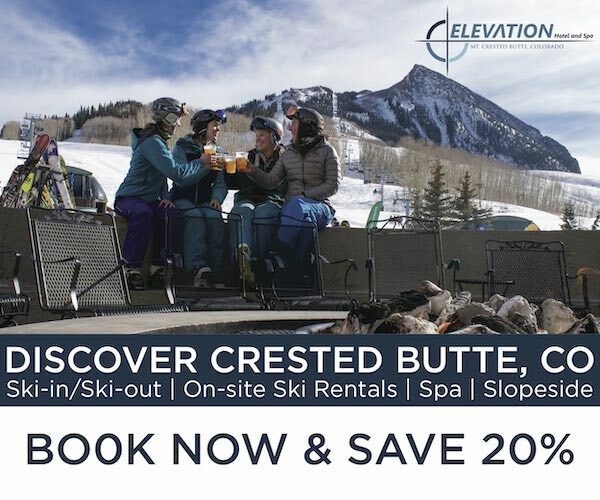 http://www.Skicherrypeak.us I’m the one in the green helmet as the pictures scroll. I know PSIA has good success with narrower shaped skis in lessons where we instructors are also in control of the terrain we take them on. I have no idea afterward though. I see them doing well and having fun but don’t really see them off piste nor do I honestly know how they would do on a wider ski at their ability level. I do know wider skis make my skiing significantly better, and easier, off-piste. Having fun and returning to do it again are the most important factors. Much more so than technique. Newer, wider skis have had many many positives on skiing. I do worry about one negative though. As skiers gravitate to a wider ski and only own one pair, they tend to only ski when it dumps. 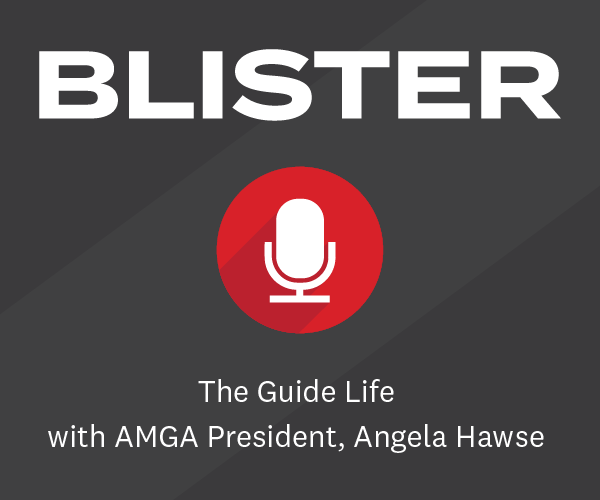 So, if your assumptions are correct, what to do about it and how to go about it. It would be a huge undertaking to make it happen. It may happen by itself over time. Someone needs to do an experiment by putting never-evers and beginners on wider skis, sending them out on there own, and comparing results. Being a ski school director and instructor I am in a position to try to test this a little. They’re likely to be on a wider ski sooner than later so maybe we should introduce them a little quicker. Sorry this is a bit rambling. I just kept throwing thoughts in. I’m also coming from a bias of teaching mostly very small Children. I would have no issue at all in teaching an adult in 85 to 105. 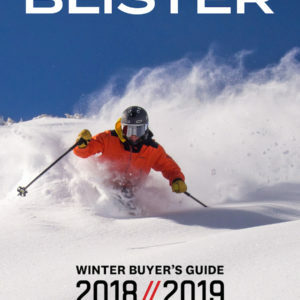 In looking at your list of beginner skis it looks like you are speaking more of adults. What are your thoughts on kids and kids skis? Interesting question, David. And you are correct – I very much have in mind here adults and young adults, and I haven’t spent enough time watching and talking with very small kids (let’s say … 50-70 lbs) on kids skis to have a very informed opinion. That said, I would still imagine, at least, that there is an argument against going with skis with a ton of sidecut, where the assumption is that the skier already knows what to do with that sidecut and those edges. Certainly, I would still want to some tip and tail rocker on these skis — even if they would never be venturing off-piste. But again, I will also admit that I am far less ready to go to the mat here when it comes to very small kids & kids skis, so I’d be interested to hear from you and others about how well you think my arguments translate here.